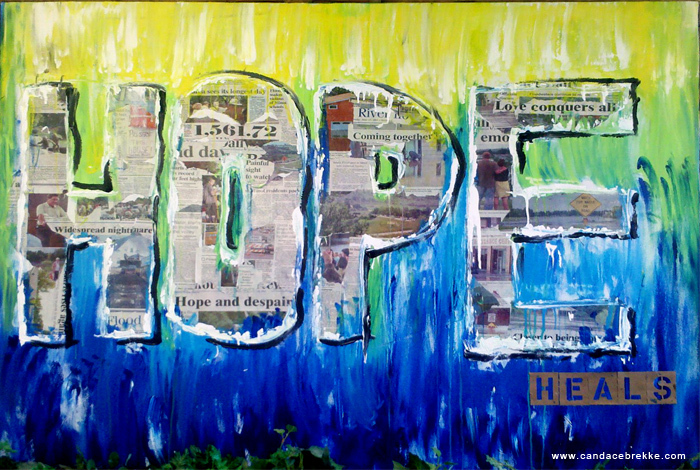 If you had the chance to take part in the Summer of Hope events this past weekend, my HOPE HEALS painting was on display at the Minot Convention and Visitors Center. This is a piece I wanted to do as a commemorative piece, using photos and articles from the Minot Daily News that I had saved from last year. The words and images tell a story of the events from last year's devastating flood. 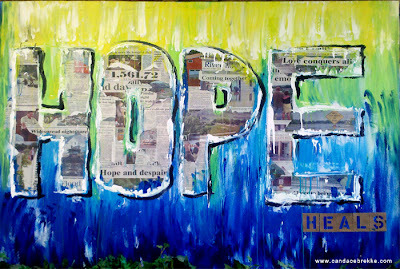 My wish for those that are still recovering and trying to rebuild their lives is that they have continued HOPE for the future. I am in awe of the strength and determination it has taken for them to rebuild their lives. Some are back home and can look back and see how far they've come. Some are still in limbo and don't know where to go or what to do...even a year later. Some have just left and moved on. I am sure there are those that didn't want to hear anything about the anniversary of the flood this weekend. But maybe for others, a simple piece of art can capture a memory and remind them of how strong they are for getting through it!